Page Break -shortcut (cmd + Enter) no longer works? I've always used Command + Enter (on number pad, not Return) and been able to insert a Page Break without using my mouse to choose it on the Menu. Now, I find that Cmd + Enter does not insert a Page Break. And I don't see keystrokes next to the command on the Menu. Bummer. I did find a way to put it on the Toolbar using the emoji of my choice. But, I miss the keyboard shortcut! If there's something I'm missing, like a keyboard shortcut way to do it, Please let me know! I don't see keystrokes next to the command on the Menu. Bummer. […] If there's something I'm missing, like a keyboard shortcut way to do it, Please let me know! You can assign your own keyboard shortcuts to most if not all menu commands in Nisus by going to Nisus Preferences –> Menu Keys. See more, especially about using multiple letters as mnemonics, on p. 573 in the User Guide. For 'Page Break' I use ctrl+option+com+x, which—compared to your previous approach—has the advantage that my right hand is free while I perform the action. THANK YOU, Þorvarður!!! That did the trick. I assigned an easy to remember one for now. And now I know I can change it any time I want. And, I can assign other ones to Menu Keys! Over the years we received a lot of questions asking us about that symbol and how to type it. Þorvarður's suggestion to customize this (or any) keyboard shortcut is a good one. I myself use Command + PB for Page Break, since I find multi-key shortcuts easier to remember than a host of modifier keys. Thank you, too, Martin! I was curious about why it was gone. To me it made perfect sense using the Enter key? btw, is there a way to mark a thread "solved?" I tried working with a new shortcut for Page Break for a while, but entering Page Breaks without the RETURN key just didn't feel right. And Nisus Writer wouldn't let me create my own shortcut with the RETURN key as the trigger. But you can create application-specific shortcuts in System Preferences as well. And there the RETURN key is accepted. So now my shortcut for Page Break in Nisus Writer can be COMMAND-ENTER again, or another combination I choose, and the shortcut even shows up in the menu. The correct symbols show up. I just can't see those symbols in Nisus Menu, and they don't work when I try them. Do I have to completely reboot the machine? Because I've tried restarting Nisus. I undid keyboard shortcut, in sysPref. Then I opened Pages and see that the Insert Page Break works using Command+Enter (which looks like the image Martin posted). In LibreOffice Writer, Command+Enter and Command+Return (which looks like the sysPref symbols I tried), both get Insert Page Break. Guess I'll just go back to the Command+0 That way the keystroke is close the the Enter key. I've tried over and over, can't get Command+Enter to insert a Page. Sorry to hear it doesn't work for you. In System Prefs, I only entered "Page Break", but just now I tried replacing it with your version "Insert->Page Break" and it works as well. 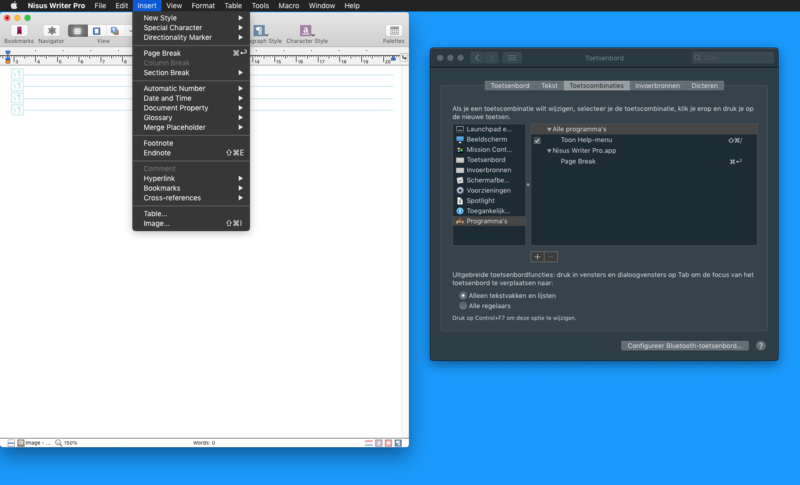 Did you remove any shortcut for the Page Break in the preferences of Nisus Writer before entering one in System Prefs? That's the only reason I can think of for it not to work. Restarting or anything is necessary. I can have Nisus Writer and System Prefs open at the same time, use a shortcut in Nisus Writer, command-tab to System Prefs and change that shortcut, command-tab back to Nisus Writer and the changed shortcut immediately shows up and works in Nisus Writer. Yes, I removed the Nisus preference before trying the System Preference. And, I removed everything and tried just typing Page Break in System Pref. Are you using Nisus Pro 3.0, Right? or one of the Nisus Pro 2 versions? I can't think of anything else to check. It's not a deal breaker....maybe they will bring it back, right Martin? btw, there's a real cool little app that shows you a lot of the keystrokes for each app you are in. And, it's free. It's by mediaatelier and it's called CheatSheet. Do a google. Although I use startpage for searching and duckduckgo is good, too. It is Nisus Writer Pro 3.0. Thanks for posting that POost. Another question? What version of Mac OS are you using? It looks, because I see the dark mode, to be Mojave? I am using Sierra. This machine cannot go above High Sierra, just misses the mark by half a year (although I do know there are experts out there that could probably force the machine to upgrade or something?). I haven't gone to High Sierra, because I have an SSD and a Regular drive inside and there's some cautions about the new file system which I would love to use. I do have my MacBookPro which I am going to upgrade to Mojave soon, so that would be a good test. My guess is that the Mojave is allowing this behavior and Sierra is not allowing it. Just a hunch. After I upgrade to Mojave on the MBP, I'll certainly post back. Or, if someone else has both OS and can test that...Martin maybe? lindas2013: I've been able to reproduce the problem where Command + Enter (newline) isn't being accepted by Nisus Writer's preferences. That looks like a bug. I'll file it as something we should look at getting fixed, thanks! I expect POost has a working shortcut for Command + Enter either because it was explicitly defined earlier (and not just the default), or because the system preferences were used instead of Nisus preferences. Given the screenshot POost posted, it's the latter. Mac system keyboard shortcuts are completely separate from Nisus keyboard shortcuts. Although the system shortcuts are more limited (eg: you can't use multi-key shortcuts) they might be helpful in a pinch. That's great (not great) that you can reproduce the issue. Cool, because you guys will work out the bug. Another reason to love Nisus! Awesome support!